Now we were back on the Mekong River again to enter Vietnam. The boat on this journey has better seating with an open area with seats on deck. The toilet facility was also better. 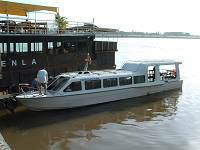 The journey from Phnom Penh to Chau Doc in Vietnam is about 5 hours on the boat. The scenery was getting more interesting & changing as our boat was getting nearer the border. There is a stop at the border to go through immigration first on the Cambodia side. We all got out & walked into a little office for our stamping out of Cambodia & passport check. Then we were back to the boat & handed over our passports to the boatman who got off to the Vietnam border checkpoint to sort out our entry. We waited on the boat about 20 minutes then the boat was off again toward Chau Doc. From the border checkpoint to Chau Doc is about 2 hours on the boat, the best way to see the Mekong Delta with stilt houses along the riverside & fishing boats sailing by. The natural scenery of the Delta remains fresh & unchanged. My memory of the greenery along the river from my childhood days in the sixties is still the same. I am always touched by the simple & ordinary life of the people in the Mekong Delta. I have changed since I left Vietnam in 1969 but this part of the world remains little changed. The boat arrived at the pier of the Victoria Chau Doc Hotel to be greeted by our favourite guide in South Vietnam, Mr.Hieu. 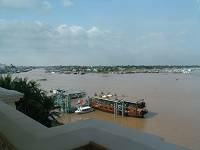 We checked in to the hotel and found the view from our room balcony is stunning with the Mekong River streching out ahead. Tonight, before our dinner, we met up with another of our clients, Mr & Mrs. Auerbach, who were on their honeymoon trip through Thailand, Vietnam & Cambodia. It was very nice to listen to their experiences of their trip so far. Next morning we drove from Chau Doc to Can Tho & checked in at the 4* Golf 4 hotel. While Chau Doc remains quite unchanged, Can Tho has changed quite a bit. 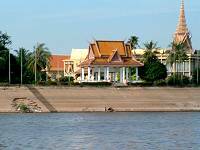 There are two new hotels by the river, Golf 4 & Ninh Kien. The outdoor old market by the river has been moved indoors. The place where the old market used to be has been turned into a riverside walk with seating areas for people to enjoy. There is also a lovely restaurant where the centre of the old market used to be. Can Tho is being developed but I am pleased that it has been kept in the local style. Golf 4 is a modern hotel with good rooms & a good standard. The best of it is the river view from our room balcony. 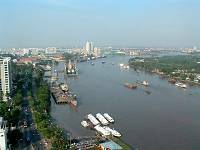 The river & daily life of Can Tho is right beneath the window. We use this hotel in our superior hotel category. The 3* Ninh Kien hotel right next to Golf 4 hotel is our standard hotel offering. This large hotel has a very good position right on the bank of the river. Some of the rooms also have wonderful views of the river. Tonight we met our third client, Mr & Mrs. Croll, at the Victoria Can Tho Hotel, It was also good to hear about their trip so far from North to South Vietnam. The Victoria hotel is the best in Can Tho and in our deluxe category. Our dinner tonight at the Nam Bo restaurant by the river was excellent. This is the restaurant we use for all our clients in Can Tho. It has a lovely atmosphere with beautiful local design and was very busy. We had a table on the balcony outside looking over the street & river below. We drank too many bottles of Saigon beer with Luan, our director in Vietnam and Hieu. The dishes we had were Vietnamese tomato soup, squid, beef satay, stewed pork in clay pot, vegetables & rice. The desert of fried banana was excellent. Next morning we drove to Ho Chi Minh City. I still love coming back to Saigon as we called the city in my day. The sounds, bustle and the busy motorbikes make this city unique in the world. After lunch at the very busy Ngon Restaurant and some hotel visits, we went to the Sofitel Plaza to meet our clients, Mr & Mrs. Korn, just arrived in Ho Chi Minh City for their Vietnam & Laos Indochina tour. A little later we met up yet more clients, Dr & Mrs. Lake, at the Oscar hotel. Dr & Mrs. Lake were originally from Luton, just a couple of streets away from where I lived for almost 15 years. It isn’t a small world that we should meet up in Ho Chi Minh City years later. We drove out of Ho Chi Minh City at around 7pm on our way to the seaside town of Phan Thiet. We arrived at around midnight & checked in our very popular superior resort hotel, the Saigon Mui Ne. I rose next day & looked out to the tropical gardens from our patio door with the sea washing gently to the white sandy beach a short distance away. This is not a top-luxury resort but is a very comfortable one, with lots of Vietnamese style and a great location is right on the beach with a lovely open bar & restaurant. The gardens are a patricular feature of the Saigon Mui Ne, with pool, lakes & rockeries all in a lovely natural setting. All systems go today we have another 9 hotels to inspect or revisit, and just one morning to do it! There are many new hotels since we came here two years ago. 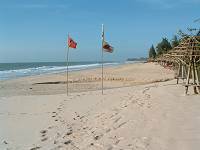 First on the list was the new 5* Pandanus Resort, situated right at the northern end of Cape Mui Ne, and therefore offering a somewhat quieter stretch of beach. 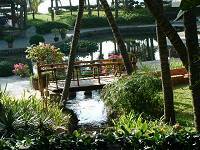 It is a large resort with beautiful gardens all around the accommodation of rooms & bungalow. The water feature beyond the lobby area of two level of pond is the central piece of stunning design. Next down the bay was the Little Mui Ne Cottages. This is a delightful small 3* hotel with the lovely cottage design accommodation right on the beach. It is simple but with style & comfort. Next we visited Bon Bien Resort. This is another new 3* hotel with a good position on the beach. This resort is designed more in the Vietnamese style. 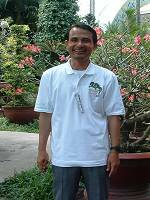 The young son of the owner is now running the resort & he makes all guests very welcome at the Bon Bien. He certainly gave a very warm welcome to our clients Mr.& Mrs.Wasson who stayed at the resort over Christmas & New Year. Next we visited the Coco Beach Resort. This is a very lovely resort right next to the Saigon Mui Ne. All rooms are cottage style wooden bungalows with front sitting verandas. This is a small resort with a feel of personal care from the owner. The breakfast restaurant is super & right on the beach. Next door, the Blue Ocean Resort nearby has very impressive entrance & lobby. And so to the popular Bamboo Village where many of our guests have stayed over the past couple of years. The Bamboo Village has been enlarged and improved, and now has a new wing with its own pool & bar area added to the property. We met the owner, Ms.Lucia Ngo, and told her how impressed we were by the improvements to the resort. We finished off with visits to the Sailing Club, the Seahorse Resort, and a revisit to the Victoria Resort. The Sailing Club is a beautifully designed boutique hotel with Vietnamese thatched cottages with stylish interiors. The Seahorse Resort is a larger resort hotel with lovely gardens & pool. The Victoria Resort is still as we remember it from our visit 3 years ago. We had lunch at the small local restaurant across the road from Victoria Resort. I remembered it as a small café selling drinks 3 years ago when we went in for a beer. It is now a busy restaurant. We drove back to Ho Chi Minh City for our return flight to UK. Ho Chi Minh City airport also has improved with additional shops & restaurants. I left Vietnam again, this time with a strong feeling that Vietnam is changing quickly. There are more hotels, shops & restaurants going up every year. 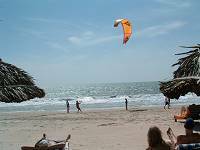 The beach in Phan Thiet just a few years ago only had a handful of hotels but it is now growing into a sophisticated resort.